QB - Beau is a High Quality QB! Recommendations of looking into QB exposure opportunities - Duke - Coach Cutcliffe - ODU - Coach Whitcomb - Samford - Coach Hatcher. Exposure at this level will be a huge factor. Recommended Level of Play: High Level QB Skill set - Beau can play! Size will bring in some hesitation, however, 2 minutes of video and every college coach will see Beau is a qB that can "Spin-it!" He is quick, transfers his weight at a high level and presents an Elite Level presence in the pocket with very quick decisions throwing WR's open! Beau is a Player to WATCH! Very good Recruit! The MFE-index rating – is an exclusive evaluation using the metrics of individual profile, athletic ability, fundamental display of position mastery and level of play! 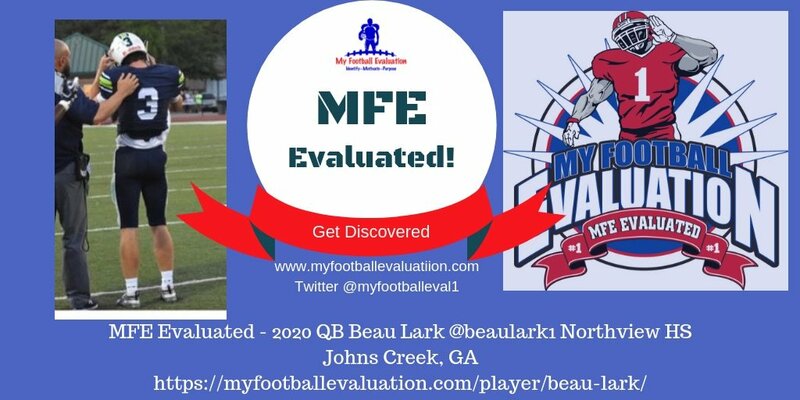 MFE Evaluation Scale: Evaluation of a High School Football player as it relates to Projected Level of Play, Impact at the College Level, Projected College Starter and Post College Projection. 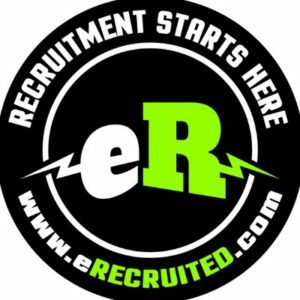 *Resources include 247 Sports, Rivals, ESPN.com level of play rating criteria combined with the MFE-Index + *100+ years of College coaching and recruiting experience. 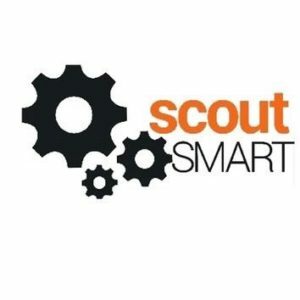 MyFootball Evaluation and scoutSMART prepare our recruits using a customized analytics platform helping to become the best recruits for college coaches! An exclusive evaluation combining the metrics of individual profile, athletic ability, fundamental display of position mastery & a customized analytics platform that merges quantitative and subjective data & is reviewed by College Coaches from all levels of play! 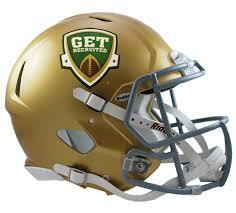 Coach Keys: *Polished– Pro-Style or Spread QBs *Spin Efficiency: Excels throwing – Deep Out, Comeback, Dig, and Seam Route with no loft / *Arm Strength– Ability to throw the ball through the goalpost from opposite 40-yard line / *Proficient abilityto throw receivers open & ability to execute the back-shoulder throw / *Dual-Threat QBsmay be raw as passers but best pure athlete on the field / *Demonstrates High level QB ability– All-State level *Recognition from national recruiting media & Premier National Camp & Combine presence a MUST. Coach Keys / * High Level Play– Pro-Style and Spread QBs possess 2 0r 3 of the qualities of a FBS QB / *Spin Efficiency– Ability to throw the Deep Out, Comeback, Dig, & Seam Route with slight loft. *Arm Strength– Ability to throw ball through goalpost from 50-yard line / *Proficient abilityto throw receivers open and execute the back-shoulder throw. *Dual-Threat QBscan be raw as passers but must display the ability of a pure athlete on the field with above average size/speed combinations / *Demonstrates High Level QB ability– All-Conference level at minimum. *Recognition from national recruiting media and Premier National Camp & Combine presence helpful. 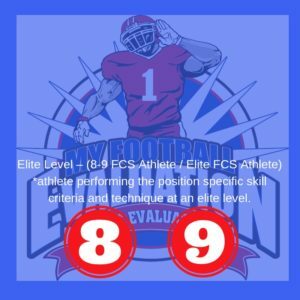 1 – Elite Level – (8-9: FCS Athlete / Elite FCS Athlete) Video demonstration of the athlete performing the position specific skill criteria and technique at an elite level. Physical Profile at or above the preferred size metric determining level of play scale. Speed, knee bend, quickness and hip flexibility at or above preferred numbers or range metric determine level of play scale. 2 – High Level – (6-7: FBS Athlete / High Level D2 Athlete / Elite D3 Athlete only lacking profile size) Video demonstration of the athlete performing the position specific skill criteria and technique at a high level. Physical Profile at the preferred size metric determining level of play scale. Speed, knee bend, quickness and hip flexibility at preferred numbers or range metric determining level of play scale. 3 – Adequate Level – (4-5: D2 Athlete / High Level NAIA Athlete / D3 Athlete) Video demonstration of the athlete performing the position specific skill criteria and technique at a fundamental and functional level needing work but adequate. Physical Profile at or near the preferred size metric determining level of play scale. Speed, knee bend, quickness and hip flexibility at or near preferred numbers or range metric determining level of play scale. 4 – Developmental Level – (1 – 3: D3 Athlete / Low Level NAIA Athlete) Video demonstration of the athlete performing the position specific skill criteria and technique at a developmental level needing work. Physical Profile below the preferred size metric determining level of play scale. Speed, knee bend, quickness and hip flexibility below preferred numbers or range metric determining level of play scale. Beau displays Adequate Level physical profile, Adequate Level core strength, High Level athletic ability relating to quickness, COD & ability to stress a defense in space. Beau demonstrates Elite Level quick and decisive decisions, Elite Level body language & non-verbal posture, Elite Level command of the Offense, Elite Level demonstration of Identifying Coverage and Elite Level ability to get the Offense out of a bad play and into a good play. Beau demonstrates Elite Level display of poise in the pocket, Elite Level patience and a sense for extending the play keeping eyes downfield, Elite Level ability to locate to the open throwing lane, Elite Level demonstration of knowing where check down is located, and Elite Level ability to know when to get rid of the ball and live to fight another day or tuck and run getting positive yards. Beau displays Elite Level posture, cradling of the ball in the “Tuck”, Elite Level sprint out mechanics and athletic ability, Elite Level posture, mobility and body movements during play action, and Elite Level lower body passing mechanics with feet, gather and transfer to front foot and hips at target, maintaining high delivery point. Beau displays Elite Level grip and ability to get the ball out of hands quickly, Elite Level tight release, Elite Level minimal wasted throwing motions, Elite Level catch-arm & set from Gun, and Elite Level ability demonstrating consistent release point of ball adjusting wrist velocity to touch of throw. Beau demonstrates Elite Level velocity and spin, Elite Level transfer and foot placement at set up, Elite Level hips at release to the target, Elite Level ability to control wrist at release point adjusting velocity, High Level ability to delivery the deep out from the hash to the field numbers with velocity and accuracy, and High Level vertical distance arm strength. Beau demonstrates Elite Level display of throwing WR’s open, High Level display of throws deep outside the #’s, Elite Level display of throws to seam, Elite Level display checking to 2nd/3rd option, Elite Level display to windows in zone! Beau demonstrates Elite Level display of run instincts and escape ability, Elite Level display of pocket instincts feeling the rush, Elite Level moving in the pocket aiding OL pass protectors, Elite Level locating throwing windows, and High Level athletic ability and instincts extending play putting pressure on Defense. Do YOU know when a college coach reviews your video? 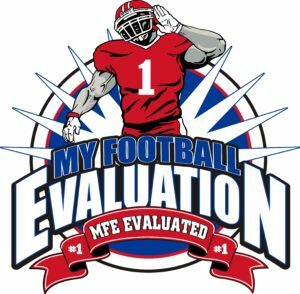 MyFootball Evaluation – #1 Evaluating Athletes and projecting level of play!